Saves the Day and Bayside decided to team up this Fall to deliver a thrilling show fans of either could appreciate. 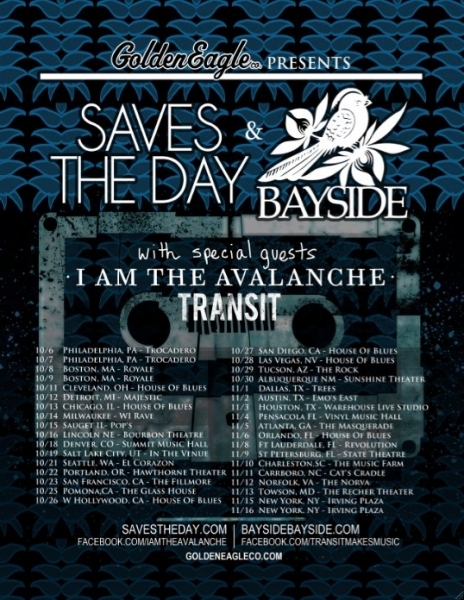 Joining them on the tour are I Am the Avalanche and Transit no less—making for one packed show lacking in any dull moments. Unfortunately, I didn't arrive in time to catch Transit, but I walked in right as I Am the Avalanche took the stage. The band delivered a high-energy performance ridden with tracks from their latest album, Avalanche United, as well as tracks from their debut album. They may not have been the headliners, but there were plenty of fans in the crowd singing along. It didn't compare to when Saves the Day stepped out though. Although the band wasn't showing any signs of tire, they were able to step back while Raneri played the acoustic track, “Don't Call Me Peanut.” He put a halt to his vocals and let the fans sing the second verse. It's always a great feeling to hear such a loud crowd sing along and everyone that night was on point. The band came back with the energetic, “Montauk,” before getting to “The Walking Wounded”-- which featured Vinnie Caruana coming out for his guest vocals in the song. Bayside ended the night with “Devotion and Desire.” The attendents anxiously awaited and yelled for an encore, but the night was over. Nevertheless, no one left the building disappointed.